On Monday the 12'th of April, White Label Space's lead engineer for the lander, Dr Andrew Barton, will present a special seminar at the Technical University of Munich (TU-München) on a Roadmap for a European Lunar Lander. The event will coincide with the Yuri's Night celebrations in Munich. For more details about this event contact events@whitelabelspace.com. This TV story about our partner the Swiss Propulsion Laboratory (SPL) was broadcast by the Swiss TV station MTW. The story shows SPL's unique test facilities and describes their activities and plans. English subtitles are included. Our partner for electronic systems, emxys, has featured in the Spanish newspaper most popular on the web, El Mundo. Below is the link to the article as well as a link to an image of the White Label Space rover concept appearing on the main page of the paper's "Science" section. The full story link also mentions the emxys plans for a technology demonstration mission called NAOSAT. More information about that will be given in a later post. Jon Oxer from Lunar Numbat gave a presentation at the 2010 Linux conference of Australasia (linux.conf.au) in Wellington, New Zealand. In his talk Jon explained how open source developers down-under can get involved in the Google Lunar X PRIZE (GLXP) through Lunar Numbat. He gave some details of the various projects currently underway at Lunar Numbat and how they fit into the White Label Space GLXP mission. There was also an interesting question and answer session at the end of the talk. The video of his talk is embedded below, split in two parts to fit in the youtube duration limit. Adriaan Rijkens, Business Management & Technology student based in Amsterdam, plans to be the first sponsored student to go into space. He wants to raise $200 thousand from sponsors to pay for his sub-orbital flight with Virgin Galactic . You can read more about his plans on his website, which also includes a nice sponsorship proposal page. Adriaan's approach is similar to our White Label Space plans to send a sponsored robotic mission to land on the Moon and rove across its surface. But why is he an otaku purple cow? A "purple cow" is an advertisement that is remarkable enough that people literally stop and look, or in some cases even make a long journey to learn more about the product! People who notice such an ad are curious, and will study it in detail for a short time. This window of time is an ideal chance for marketers to diffuse their message or idea. But idea diffusion has changed in the digital age. Seth Godin's TED talk about standing out in the post-"TV/Industrial Complex" world is a good explanation of the evolving battle for consumer attention. The image to the right (from his TED presentation) shows the changing number of consumers using a product during its life-cycle. In the past marketers targeted consumers in the centre of the bell curve, because they were the largest group of potential customers. In the modern web-connected world, marketers often target the small minority of people at the left of the curve who are called the innovators or early adopters. If you can make that small group of people like your product, they will tell their friends in the rest of the curve, spreading the idea with almost no extra cost to the advertiser. The Japanese have already invented a word for this - Otaku. To a marketer, otaku is the desire of an obsessed consumer who is desperate to try out the latest new, fresh or trendy product and tell everybody about it. Otaku-centric marketing targets that key group using unique product features (like a purple cow) and/or advertising gimmicks. So how can the principle of otaku-centric marketing and purple cows help Adriaan fly to space, or help White Label Space build and fly it moon mission? The answer lies in linking the otaku communities. The key challenge for Adriaan and White Label Space is to identify and connect people who suffer (sic) from space otaku with otaku people who have more mainstream interests, particularly in areas where large amounts of advertising money are available. By making these connections, our white label brandless missions can be the right purple cow for marketers who want to diffuse their message to just the right audience. The White Label Space engineering team has started the design and analysis of the thermal subsystem for our our Google Lunar X PRIZE (GLXP) lander. Since the lander will operate as a telecommunications relay for the rover, both the lander and the rover must be capable of withstanding the high temperature environment of the lunar day. Starting from the design outlined in our Mission Concept Summary document, our specialists Martin Lemmens and Michiel Vullings are defining the external surface optical properties needed to maintain the lander's internal equipment within the required operating limits. To analyse the thermal performance of candidate designs, the team is constructing radiative equilibirum models such as as the one shown in the picure below. This early model includes only the hexagonal body of the lander and a deployable solar array. The lander is offset above a simulated lunar surface. Following the same approach that was used in NASA's (Lunar) Surveyor missions, the solar array is actuated about one axis. By controlling the roll angle of the lander at the time of touchdown, the rotation axis will point either north or south, and thus it is possible to point the solar array directly at the sun for the complete lunar day. 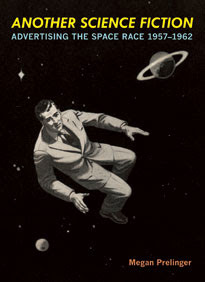 The images are featured in a new book by Megan Prelinger called "Another Science Fiction: Advertising the Space Race 1957-1962" (book cover shown on the right). Blast Books has a good description of the book. Following on from the earlier post, this is a video showing some of professor Yoshida's seminar at AOES last weekend. Saturday 27th February 2010, professor Kazuya Yoshida gave a seminar at the White Label Space Headquarters located at the offices of AOES Group BV in Noordwijk, the Netherlands. In his seminar he explained the technical challenges of lunar rovers and presented the upcoming plans for the White Label Space rover developments currently underway at the Space Robotics Laboratory at Tohoku University in Japan (see recent video post). Accompanying him on the podium was Dr Andrew Barton, the chairman of the White Label Space Foundation, who provided an introduction to latest activities at the White Label Space Headquarters and the team's plans for the rest of 2010 and beyond. After the presentation, the visitors were treated to a display of mock-ups as well as sample hardware and posters from the team's Partners. The event was also the first chance to show a prototype of the egress ramp system that enables the Rover to safely drive from the top of the landing platform down onto the surface of the Moon. The egress ramp prototype was built by AOES engineers and was inspired by the ramps used in the successful Lunakhod Moon rover missions by the Soviet Union. Also on display was hardware from the Wroclaw University of Technology, including a back-up antenna from the ARISS project. Two such antennas were successfully launched in 2008 attached to the Columbus module of the International Space Station (ISS).